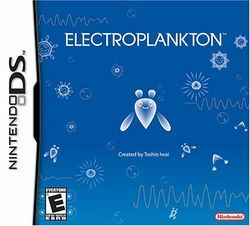 Electroplankton is a unique piece of software for the Nintendo DS. It's hard to describe, as it is not a game. If you could define it, you'd probably call it 'touchable media art'. It's an amazing display of creativity, created by the renowned Toshio Iwai. It's something that you have to experience to fully grasp. Electroplankton has been available in Japan for quite some time, and has finally been released in North America via online retailers and the Nintendo World store in New York. Note: Most of the information contained within this article is derived from the Japanese version of Electroplankton. This page was last edited on 12 April 2017, at 05:22. This page has been accessed 10,485 times.